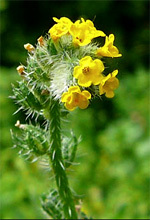 Fiddleneck and other related plants of the amsinckia species have been linked to causing cirrhosis of the liver in horses. This category of plants includes fiddleneck, tarweed, yellow burr weed, fireweed and buckthorn, which are predominantly found in the semi-arid regions of Idaho, Washington, Oregon and California. The fiddleneck plants appear in late winter and early spring. The seeds are the most toxic parts of these plants and fortunately, the mature plants are unpalatable to most horses. Most instances of poisoning occur when mature amsinckia species are bailed in early cuttings of hay or when contaminated grain was threshed for horses. Some poisonings have occurred when horses were pastured on wheat stubble in contaminated fields. 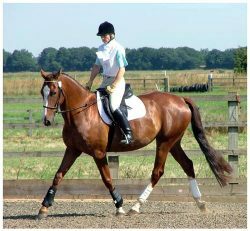 Cirrhosis causes hardening and eventual metabolic shutdown of the horse’s liver. The liver can no longer filter out toxic wastes which, among other things, produces disturbances of the nervous system. Sometimes death results from the horse getting hopelessly entangled in a fence or literally walking over the edge of a cliff or ravine. staggering, "dragging" of the hind limbs, which have been described as the "sleepy staggers". The horse may also appear listless, hang its head and acting sluggish or depressed. Signs of colic may be present, which may include straining, diarrhea and rectal prolapse. Small foul smelling ulcers may appear in the mouth. Unfortunately, once cirrhosis of the liver develops, it is for all practical purposes, irreversible. The chronic horse will become a poor keeper, show yellow membranes around the eyes and mouth, produce a rough coat and eventually become anemic and die. NOTE: Healthy horses need to consume fiddleneck, (amsinckia type plants) over a period of time before enough liver damage occurs to produce symptoms. Ankylosing spondylitis amlodipine cost walmart shares many features with several other arthritis conditions..